A Sino-France research team reported preliminary dating results of seven herbivorous fossil teeth from different archaeological layers of the lowest geological unit (C III) of Longgupo Cave site, Wushan County, Chongqing, China. 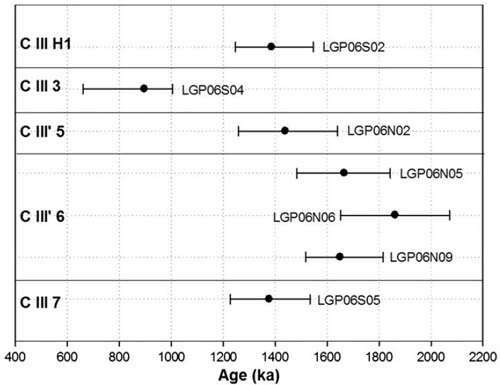 The obtained US-ESR results published in the July 2012 issue of the Quaternary Geochronology, show that the age of six teeth are basically consistent, between 1.4 and 1.8 million years ago. This result confirms the antiquity of Longgupo site which could have an impact on the chronology of hominid presence in southern China, helping better understand the human migration and settlement in East Asia. Longgupo cave, also called Wushan hominin site, is located in Wushan County, 20 km away from the south of the Yangtze River near the eastern border of Chongqing, China. It was discovered in 1984 and subsequently excavated in 1985-1988 by the Institute of Vertebrate Paleontology and Paleoanthropology (IVPP), Chinese Academy of Sciences, and the Chongqing Museum of Natural History. The site attracted more attention since the discovery of a fragment of mandible with two teeth, and an upper incisor. The fossils were initially assigned to a new subspecies of Homo erectus (Homo erectus wushanensis) in 1991. This makes it critically important to the study of humans origins as it suggests that H. erectus was not the first human species to leave Africa and supports the argument made by some that H. erectus evolved in Asia and not Africa. More recently, the jaw fragment has been argued to be indistinguishable from Late Miocene-Pliocene Chinese apes of the genus Lufengpithecus. 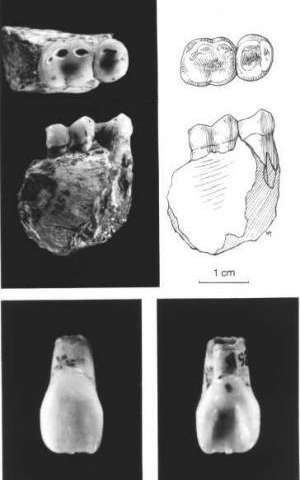 The incisor has also been argued to be consistent with that of an East Asian person that accidentally entered the deposit: "brought in by flowing water or other forces into the fissure of the comparatively old Longgupo Cave deposits". In 2003 and 2006, new excavations of Longgupo site were conducted by a Chinese-French team led by HOU Yamei of the IVPP, and Éric Boëda of Université Paris Ouest-Nanterre La Défense, providing detailed information about the site formation process and the stratigraphical sequence. 854 artifacts were unearthed at Longgupo site, including worked cobbles, unipolar flakes, bipolar objects, knapping fragments and hammerstones. 90% of the raw material was local Triassic limestone, and the other 10% were exogenous materials. The hardness and presence of natural fracture planes in the Triassic limestone are the main reasons of different operational processes and high number of knapping accidents. The archaic age with such uncommon raw materials makes Longgupo industry difficult to compare with other Chinese sites, and the unique technological option indicates it follows a separate line of development with contemporaneous African sites, said HOU Yamei, coauthor of the study. With the undoubted evidence of 16 Gigantopithecus teeth and numerous stone artifacts, Longgupo caveis doubtlessly a crucial archaeological site. In order to complete the chronological framework of the site, fossil teeth were sampled for ESR/U-series dating study during the new excavations. Researchers used combined ESR/U-series method to model U-uptake history of the fossil tooth.They analyzed seven herbivorous teeth which were sampled in different layers of Longgupo site from both south and north areas. All the teeth present only enamel and dentine dental tissues, hence sediment-enamel-dentine geometry was considered for age calculation. The two dental tissues were separated mechanically with a dental drill, outer enamel surface was cleaned to remove the effects of external alpha radiation, then grinded, sieved and split into 10 aliquots for gamma irradiation. Uranium-series analyses indicate that no obvious uranium leaching has occurred and all the teeth (except one) underwent a very recent uranium uptake history. The combined ESR/U-series dating work in this study permits to propose a preliminary age for Longgupo site. Six of the seven analyzed teeth collected from C III-C III unit resent an age comprised between 1.4 and 1.8 million years ago. We observed an inverse correlation of two samples with the stratigraphical sequence. This could be caused by the distinct uranium uptake history of one sample, high uranium content in the enamel for another or bad estimation of external dose rate,said Fei Han, first author of the study, Institute of Geology, China Earthquake Administration, and Departement de PrehistoireMuséum National dHistoireNaturelle, Due to the complexity of the stratigraphic sequence, supplementary in situ gamma dose rate measurement should be performed for all the samples during the following excavations in order to confirm this preliminary ESR/U-series chronology.